One month until Halloween! I am not even close to ready, but I have made some progress with our Halloween costumes. I started by tackling the "chainmail" that Trevor will wear beneath his knight tunic. I had what I thought would be a brilliant idea: I could take some grey sweatpants, put window screening over them, ink through the window screening and it would make the perfect chainmail. Unfortunately, the idea was less than perfect. It was very difficult to get the ink on evenly, and Staz-On was definitely not the right ink for the job. I tried a few others, but this was the best I could get. Not exactly chainmail. From a distance, it just looked dirty. Bummer. Clearly, I needed larger openings than the window screening. And ideally, I needed a circle. I toyed with making my own stamp using a tiny rubber band or washer, then (thank goodness) found a tiny circle stamp in my stash. I did a test patch and loved the way it looked! Now that's chainmail! During a recent Fiskateers event, I spent hours stamping this little circle about 8 million times. I stopped just above the knee and am crossing my fingers that I won't have to add more rows. My gnarled, sore fingers. That was a LOT of stamping. And I haven't done the top yet. Ack! We found this foam sword for 50 cents at Target. The shape and size are perfect, but the colors of the handle are really weird. Red and green? Why? Trevor wanted the whole thing to be silver. He gave it a few coats of paint, and now we have this. My friend Kim offered me an empire waist dress that I am going to use for my damsel costume. Trevor really wanted me in a pink dress, but that's not going to happen. This dress has too many things going for it... not only does it fit me perfectly (rare that a dress fits me so well- I don't even have to hem it! ), but it didn't cost me anything in either time or money. I have no interest in scouring the thrift shops for a well-fitting pink dress that may or may not exist. So that's the progress so far! Trevor picked out the material for his tunic, but I haven't been brave enough to start sewing it. We also have some fabric to make my cone-hat. We weren't able to find matching fabric, so we got cream. I'm not sure how that's going to look, but for now I'm ignoring that issue. As for Steve's dragon costume, I'm about 99% sure that isn't going to happen. I still haven't had a good idea of how to make it. As I look at the calendar, I see that a dragon costume isn't going to be a priority. He owns a Renaissance outfit that might fit the theme, or we might dress him as a king. That sounds so much easier than a dragon. Trevor has always been a collector, specifically of nature items such as rocks, pine cones, feathers, oak galls, and acorns. Lots and lots of acorns. Not long after we made the acorn napkin rings, Trevor discovered that the trees by the field where he plays soccer had just started dropping acorns by the thousands. He happily gathered up a few hundred to take home. He was fascinated by how different the two types of acorns looked. The one on the left is the type I collected near his school to make the napkin rings. The one on the right is from the soccer field. We decided to make a wreath. We took a cheap paper plate, cut off the outside edge, and then cut out the center. This left us with a basic wreath shape. And then we used the glue gun to attach the acorns around the perimeter. I operated the glue gun and Trevor placed the acorns. While he is extremely responsible and very cautious, I don't think at 5 he is old enough to operate a glue gun yet. That was fine with him. We added a bit of orange ribbon and hung up our wreath. I really like the way it turned out. And you can't beat the price, since everything in the project we either gathered ourselves or found around the house. Our chapter of the International MOMS Club has a monthly "playgroup" for those of us whose children are in school. It's called MOMS Who Brunch. What a treat to get together with my mom friends without the kids being there! This month we met at my house. I decided to serve homemade applesauce. If you've never done it before, it is ridiculously easy and so much tastier than store-bought. 1) Roughly cut any number of apples into chunks. If you have a food mill, you do not need to peel them, nor do you need to cut out the core or remove any seeds or stems if you don't feel like it. Just wash the apples, then cut them in chunks. 2) Add about 2 inches of water to the bottom of a pan, squeeze one lemon into the water, then add the apples. Place over medium heat, cover, and let sit for 20+ minutes. 3) After 20 minutes, stir the apples. If the apples are soft, continue. If some pieces are still firm, continue heating. Depending on the amount of apples, size of pan, and size of apple pieces, it could take anywhere from 20 minutes to an hour. As a general rule, they're done when they smell really good. They'll look like this. 4) Transfer the apples into a food mill. Mine is a Foley food mill and I love it. 6). You'll know you're done when all that is left in the food mill is peels, stems, and/or seeds. This goes into the compost pile or the green waste. 7) The pot below holds the applesauce. You may choose to add sugar and/or spices. I didn't add either one, but instead put out cinnamon sugar in a shaker so each person could add it if they wished. I also made my favorite coffee cake. It is so easy, can be made ahead of time, and is absolutely delicious. I got the recipe from Taste of Home. In a large bowl, cream butter and sugars. Beat in egg. In a separate bowl, combine the flour, baking powder, baking soda and cinnamon; gradually add to creamed mixture alternately with buttermilk, beating well after each addition. Spread into a greased 8-inch square baking pan. Combine topping ingredients and sprinkle over batter. Cover and refrigerate overnight. Uncover and bake at 350º for 40-45 minutes or until a toothpick inserted near the center comes out clean. Cool on a wire rack. Serves 8. *I didn't have buttermilk on hand. Did you know you can make a perfectly good substitute? Put 1-1/2 tsp. lemon juice or vinegar in liquid measuring cup, then add enough milk to bring it to 1/2 c. Let it sit for 5 minutes. Yesterday I mentioned our traditional camping treasure hunt. I had a hard time coming up with the perfect treasure.... until I read on Lego a Day that Lego had released its Series 5 Minifigs. Steve and Trevor both love anything Lego, so I thought it would be very fun to have these as the treasure. Lego is smart and has wrapped its limited edition figures so that you do not know which one you are getting when you buy one. There are some tips and hints online about how to differentiate between them by feeling the bags and looking at teensy bumps on the packaging. I waited until Trevor was at school and Steve was at the office (he usually works from home 3 days a week) to head to the store. There I did my best to feel the packages and pick out four different minifigs. Steve did not disappoint. 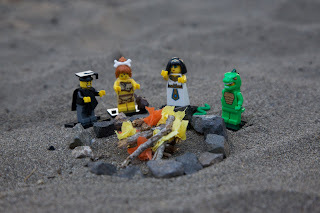 He took this awesome photo of our four minifigs warming their hands around the campfire. I took this picture of the cave woman beating up the Egyptian Queen. Fortunately, despite the abuse, the Egyptian Queen went on to graduate with honors. And Cave Woman tried out some new hairstyles, including this Martha Stewart-inspired look. Trevor's Lizard Man showed just how strong he was. Jonna's Graduate is considering a career as a crossing guard. Before I get to the last pictures, I should mention that Jonna (Trevor's godmother and our awesome camping companion) made an adorable quilted camping tablecloth. She embroidered camping images and icons in several of the squares. She had the very clever idea to use the tablecloth as the backdrop for some fun photos. Here is her picture of Lizard Man, posed perfectly next to the campfire. But my favorite photo of all, was this one. Now that's creativity. We had big plans to take more photos, but didn't when we had to cut the trip short. 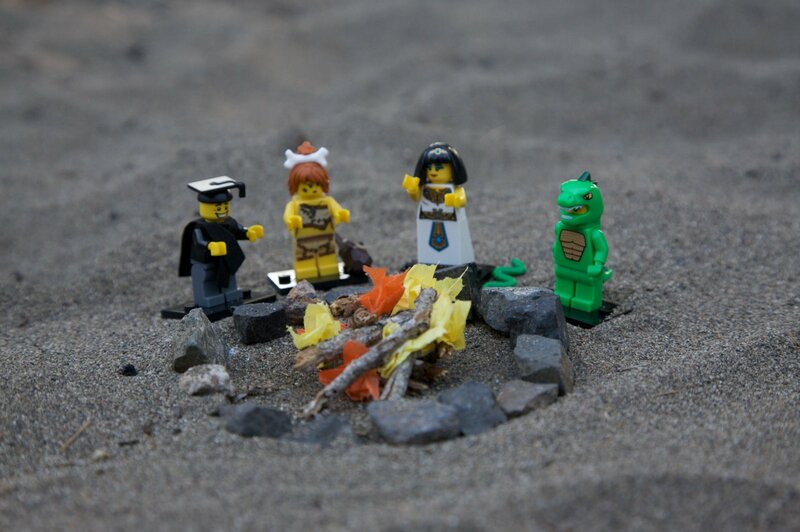 But now that we know how much fun minifigs can be, you can be sure that they'll be on my camping packing list in the future. Our family went camping recently. Unfortunately, we had to cut the trip short when Trevor had a major allergic reaction to something, swelled up, and broke out in giant hives. Fortunately, we had already done our traditional scavenger hunt and treasure hunt before we left. While Trevor did sand art (one of the prizes he won in the scavenger hunt), I did a different craft. I found an adorable campfire craft at Kaboose (link is now broken) that I wanted to try. I brought along Elmer's glue, an old CD, and scraps of orange and yellow tissue paper. The rest of the materials came from our scavenger hunt. I started by using my finger to rub an even layer of glue on the CD, stopping 1/2 inch from the edge. I dropped it upside down on the ground, which gave it a nice even coat of sand. (The blue background is REI's Camp Time Roll-a-Table. I can't say enough good things about this table. I used a generous amount of glue to adhere rocks around the outer edge. I broke the sticks into small pieces and glued them in a pile. I tore off small bits of tissue paper, added glue, and stuffed them down in between the sticks. I put the whole thing down on the ground and sprinkled more sand on top to cover any extra glue. Here's my finished craft! Isn't it cute?! During the past week, my subscribers have not been receiving notification when I post new blog content. This was incredibly frustrating. I did everything I could think of, checked settings, googled for similar problems, etc. and came up stumped. For the millionth time, I have thanked my lucky stars that Steve, Husband Extraordinaire, knows everything there is to know about computers. He fixed my problems AND wrote out a detailed summary of what he did. I'm going to post that here as a reference for anyone else who might someday be googling for solutions to the same problem. Last week Feedburner stopped processing feeds on Cindy's blog. Initial investigations didn't turn up much: feedburner's own status blog was silent and a couple of Google searches turned up nothing, so we decided to see if the problem would correct itself in a couple of days. A couple of days came and went and no results, so it became imperative to research the problem in depth and fix it. Cindy gave me access to her Feedburner account so I could troubleshoot the problem. We found out that if your feed length exceeds 512k bytes, Feedburner decides to stop processing it. OK, though it's quite unfortunate that it fails silently. This was the only hint I could find, so I started poking at the feed to discover what is wrong. First thing I had to do was disable the feed redirection on Blogger so that I could look directly at what Blogger was giving us. To do this, you must go to the dashboard, select the Settings tab, and then the Site Feed item. Here you'll see the "Post Feed Redirect URL". As you will need to restore this later, copy and paste the URL somewhere safe, then clear the box and press the "Save Settings" button. Then I was able to go to http://web-sniffer.net/ and entered the feed URL, which for Cindy's blog is http://www.cindyderosier.com/feeds/posts/default. This service then grabs the data, gives some information about it and then displays what it fetched. The shocking thing was looking at the size (displayed in red right above the content) was over 1.6M bytes! Looking into the content, I noticed a very strange thing: the first post had an embedded image. Usually, image tags look like <img src="http:/...." /> and are only a few tens of characters long. This one was like <img src="base/64%20123aF2432ab...." /> and went on forever. Aha! Here's why the feed became so large and stopped working. I mentioned this to Cindy and she remembered Blogger's editor acting strangely after inserting the image in question. Of course it was: it was trying to process a huge piece of data in the browser instead of handling a URL like it expects. 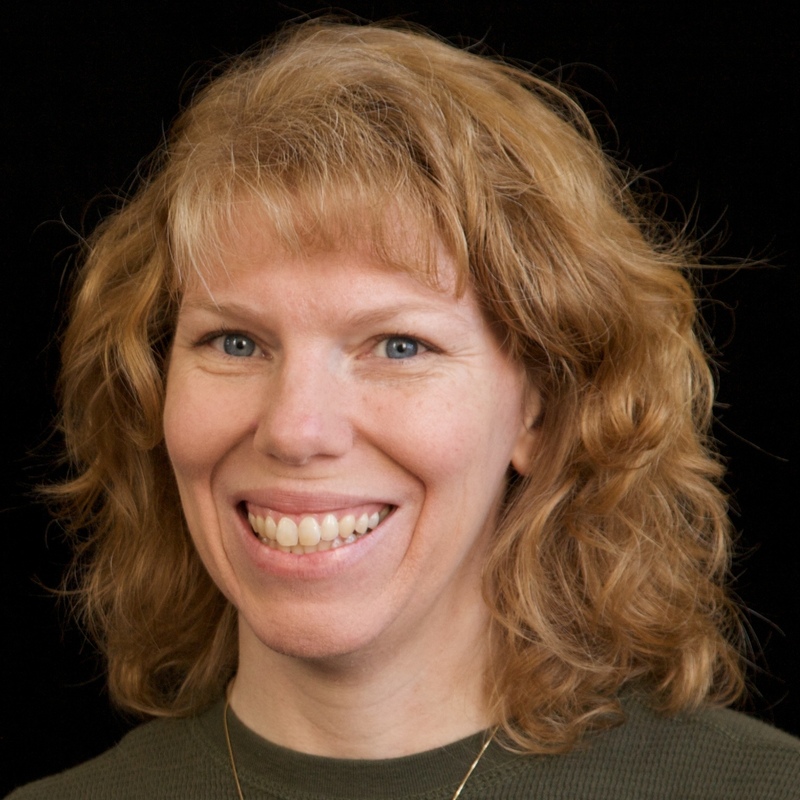 This led us to the root cause: Usually Cindy grabs files from her Picasa application, which uploads the photos to Blogger and allows her to enter an image tag URL. Easy and simple and it works. For this one image, she had grabbed it from some site by highlighting the image and copy-and-pasting into the post in Blogger. It put the contents of the file inside the post instead of referencing it. The fix at this point is obvious, though it was frustrating to do in the Blogger interface as having that image in there really drags things down. I edited the post in question, deleted the offending image and then uploaded the image to Blogger and added the image reference. From this point the Blogger editor started working properly again, and Feedburner would be happy. After fixing the problem, you have to undo the broken Feedburner redirect that we messed up later. Remember how I said to save that URL? Copy that, and go back to the Blogger Dashboard page with the "Post Feed Redirect URL" box and paste it back. Save your changes and you're back in business. There was one last thing left to do: poke the feed on Feedburner. Enter your feed address (in this case http://feeds.feedburner.com/CindyDerosierMyCreativeLife ) into Feedburner's ping page and press the "Ping Feedburner" button. Now you're done and your feed will start to show in feed readers, emails will start up again and so on. They say that imitation is the highest form of flattery. When I learn that someone loves my work enough to copy it exactly, it is indeed incredibly flattering. I recently got a message from a woman named Lisa (Dancinirish90), telling me that she'd done a lift of my layout "So Happy Together." Lisa, thanks for the compliment! And thanks for being the kind of person who gives proper credit. You're awesome. Lisa does very nice original work as well, which you can see using the link above. And speaking of giving proper credit, I should mention again that my layout was based on a sketch by Shannon White. Usually when I scraplift, my finished project bears little resemblance to the original. Try as I might to embrace someone else's, my own style pushes its way through. Over the years, there have only been a few layouts that I've copied outright. The layout below is one. It's of the most scraplifted layouts I have ever seen. And it's no wonder- it is gorgeous. This is by the fabulous MissyGinCT. I was born in Northern California and have lived here all my life. I grew up in a city about an hour from San Francisco, moved 2 hours away to go to college, and now live halfway between those two. I'm a Californian through and through. But there remain many Southern dishes that I have never tried. In my 39 years of life, I have never had fried green tomatoes. This year, our tomato plants are so heavy that they are bending and sprawling out of their raised bed and onto the lawn. We're doing a decent job of keeping up with the ripe tomatoes, but there are some huge unripe ones that are really weighing down the plant. I picked the largest and googled "fried green tomatoes." I heated up a tablespoon or two of oil, then added a few slices, taking care not to crowd them. Then I reread the recipe. Wait a minute- did that say to put a QUART of oil in the pan?? Silly Californian! I'd automatically put a tablespoon in, like I do whenever I fry something. I pulled out my tomatoes and heated way more oil. Not nearly a quart, but at least the oil was visible in the pan. I cooked the tomatoes until the crust was golden brown, then put them on paper towels to drain. I heated up some leftover spaghetti sauce and laid the fried green tomatoes on top. I added a side dish of cucumber and tomato salad. Dinner is served! And then I suddenly wondered- are fried green tomatoes an entree? I have no idea. Should I have served something else? Would they have been an entree if I'd used the entire quart of oil the recipe called for? As for the taste... well, they were OK. Not what I expected. Not as good as other fried food, nor as good as a plain ripe tomato. They were more tart than I expected, and the cornmeal crust wasn't what I expected either. Help me, my Southern friends! (Or my foodie friends from other places.) Was my version so laughable that I haven't actually tasted fried green tomatoes the way they're supposed to be? Do you like them? Do you have a great recipe to share? 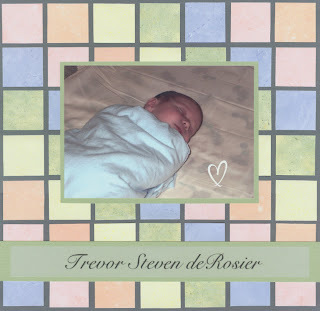 Back in June, I blogged about the zoo-themed birthday parties Trevor had when he turned five. Here is the layout from the celebration with his friends at the Oakland Zoo. I had so much fun putting this together- I love the bright colors of the pictures and wanted the layout to be equally fun and happy to match the spirit of the party. What I like most about this layout are the little details. With twelve pictures and bright lime/orange papers all demanding the viewers' attention, I needed to keep the embellishments simple, but not so plain they'd be lost. I started with the grungeboard 5. I painted it orange, rubbed it with orange Stickles, and then tied on the ribbon. I used the same Stickles to cover the brad and to fill in the center of the star-shaped button. 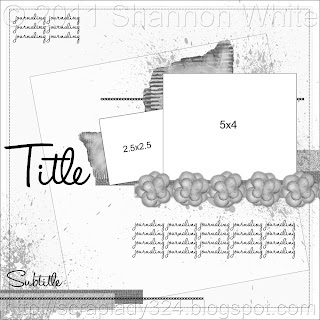 I edged the vellum circles in Stickles. I love the way the dotted vellum sets off the 5 and the date. I'd originally used the same dotted vellum for the journaling, but it was hard to read. I switched to a plain vellum and it looks much better. Such a fun layout and such great memories from a fantastic day! I spent the first 32 years of my life being Cindy Jones. Not surprisingly, my name didn't get misspelled or mispronounced very often. In fact, I can only remember two times EVER that someone got my name wrong. When I was about 13, our family went to Mexico. "HOE-ness family?" the man called to the waiting crowd. Nobody answered. "HOE-ness family?" he asked increasingly loudly. I can't remember which of us finally realized he was calling for the Jones family. It is the one and only time I've ever heard Jones mispronounced. I've never seen it misspelled. When I was 18, I became a California 4-H Diamond Star. (Scroll down to 1990-1991 to see a picture of my team.) I traveled all around the state giving speeches. Usually I wrote my own, but occasionally I received a pre-written speech. One arrived with an introduction that read, "My name is Cindy Smith." I thought this was hilarious and practiced it that way. My mom warned me not to... and I should have listened. I told an assembled crowd of about 1000 people, "My name is Cmindy Sith." And a nickname was born that lasts to this day. When I married Steve and became Cindy deRosier, I knew that my new last name would cause some problems. Pretty much nobody pronounces it correctly on the first try. Some of my longtime friends don't know how to say it. (It is French for "of the rose" and is pronounced de-ROSE-e-a. Think Cartier, Garnier, or dossier.) That was quite a shock for someone who grew up as a Jones. 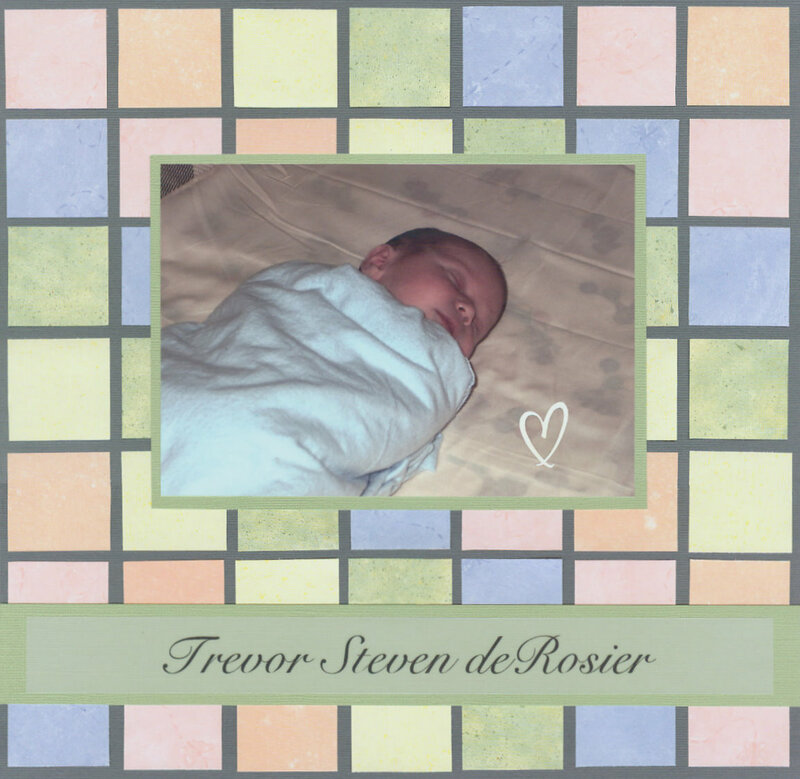 And as difficult as deRosier is to say, it is even harder to spell. It starts with a lowercase letter and has a capital letter in it with no space in between, which freaks people out. We are frequently alphabetized after the Z's, as if lowercase d is somehow not a D at all. For the last 7 years, I've been collecting address labels and other things with ridiculous spellings of my name. I keep them in a file labeled, "deRosier is not THAT hard." I have enough that I could do a whole book. Instead, I chose the 'best' and made this layout. I encourage all of you to collect misspellings of your name and make your own layout! It was so much fun... and quite hilarious to see all the weird versions of my name in one place.